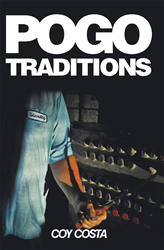 Recent release “Pogo Traditions” from Page Publishing author Coy Costa is a gripping fictional narrative that offers horrifying imagined detail surrounding some of the most gruesome murders of the twentieth century. Coy Costa, a PTSD survivor dedicated to helping others living in northern California with his husband and dog, has completed his book “Pogo Traditions”: a well-researched novel exploring a grisly world of horror, death, and murderous compulsion. Published by New York City-based Page Publishing, Coy Costa’s debut novel offers plausible explanations to some of the most notorious unsolved murders of our time. Readers who wish to experience this potent and unsettling work can purchase “Pogo Traditions” at bookstores everywhere, or online at the Apple iTunes store, Amazon, Google Play, or Barnes and Noble.